It is going to be another two post night for me here. First up is a post I am super excited about. 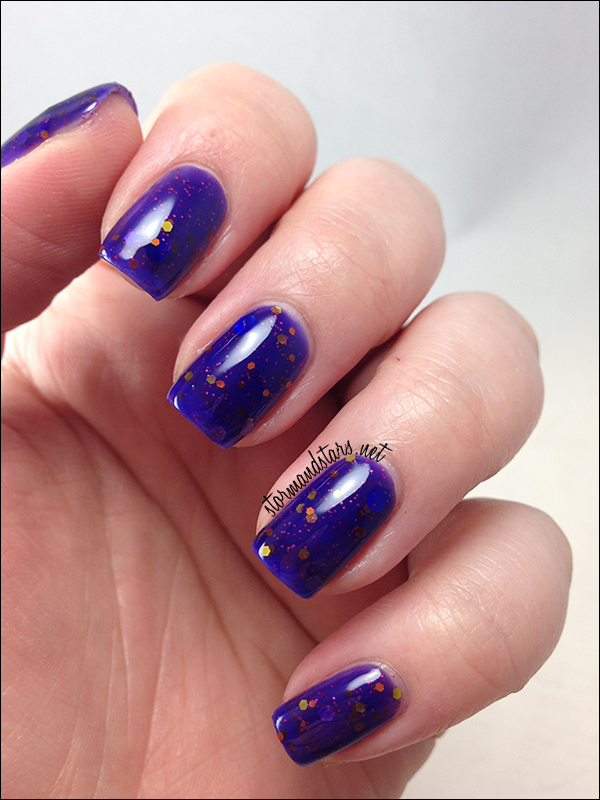 I was contacted by Jessica from Honey Buttons Nail Polish a while back and asked if I would review two of her custom made lacquers. I assumed that she would send me two she had made before to review, but I was so pleasantly surprised when I found out that I would actually be able to customize my own polish! I knew I wanted at least one of these polishes to reference my Doctor Who obsession, and specifically Ten and Rose. 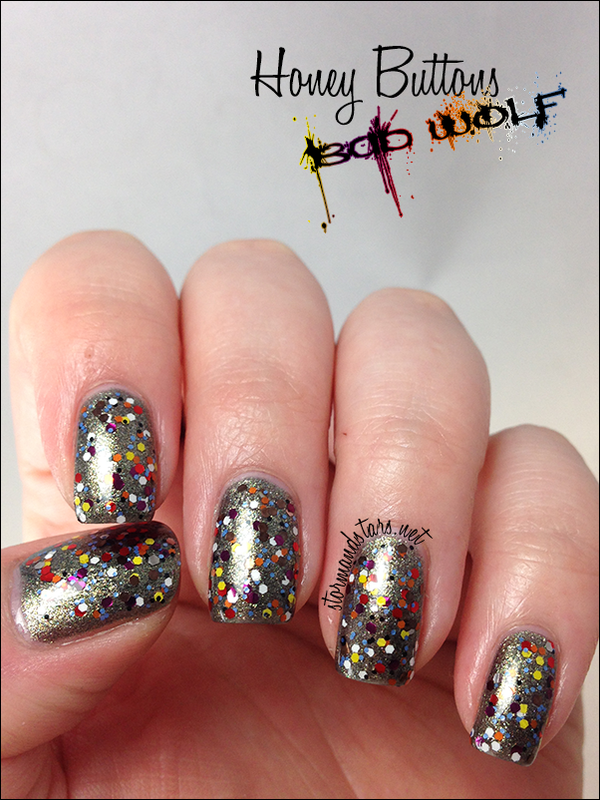 I had just ordered some fantastic Bad Wolf fabric, so I asked Jessica if she could make me a glitter topper in the colors of the graffiti on the bad wolf fabric. Here are the results! Look at all those bright colors! I used two coats here for maximum glitter coverage over OPI Rolling Bones. I topped the whole thing with Glossy Glam topcoat. 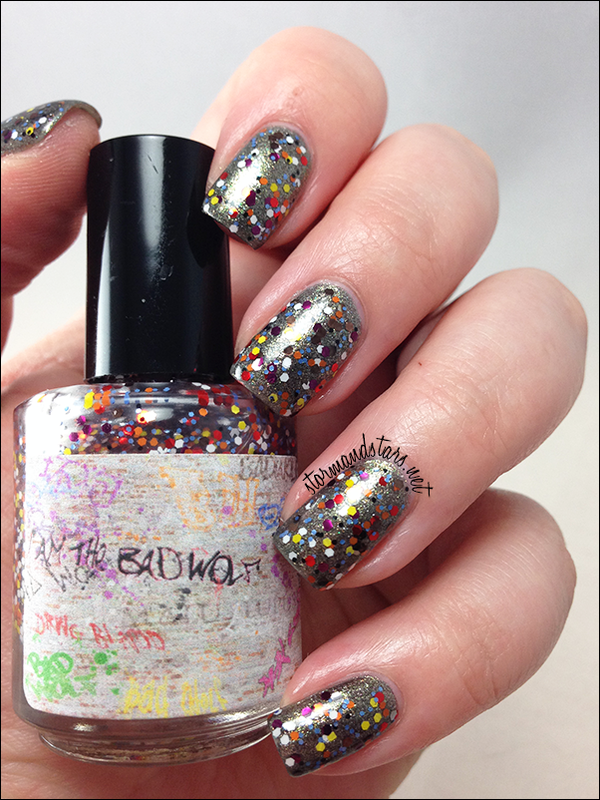 Formula on this one was great and I didn't have to hold the bottle upside down or fish for more glitter. I really love the colors in this for fall. It can be worn over so many different bases! 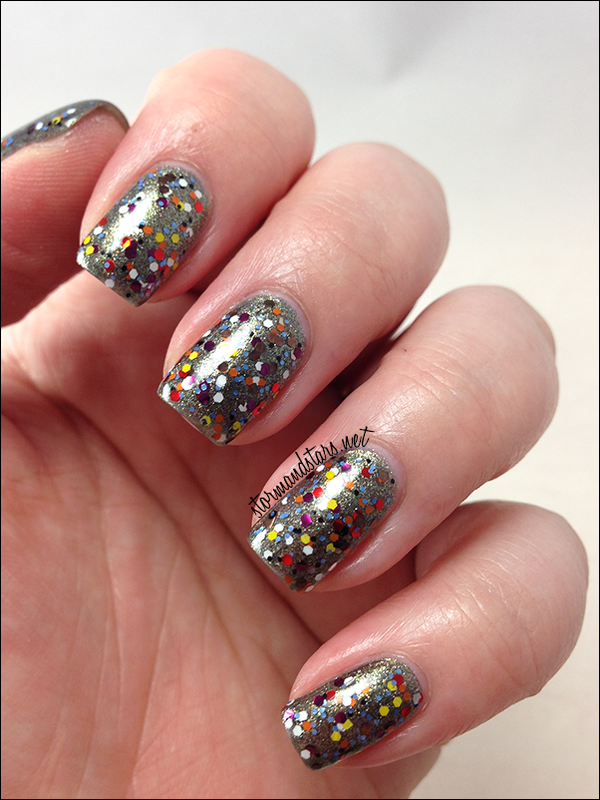 Below, you can see the inspiration for this glitter topper. The label on the bottle is a photo of the fabric it was inspired by. I love having something here that I know no one else has. I had to think a little while longer about the second polish. I decided on one of my favorite animated movies UP and used the big bird Kevin as my inspiration. 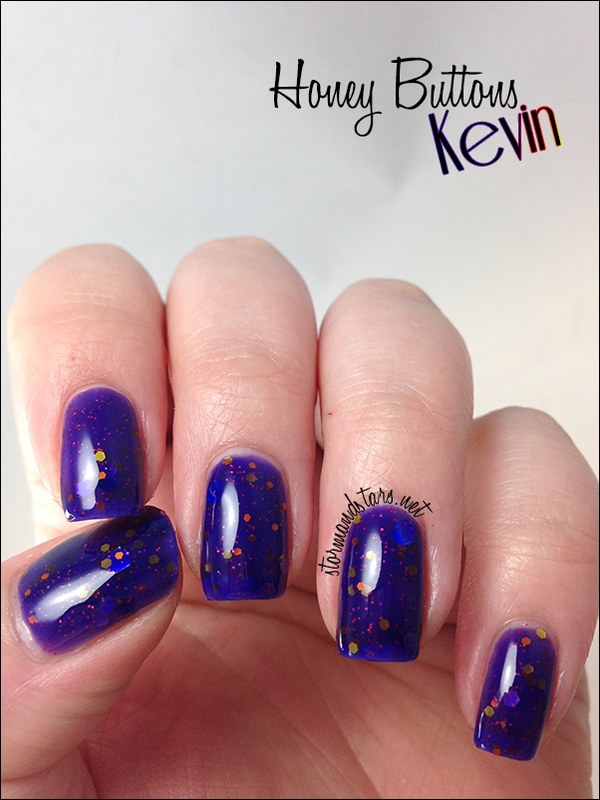 I told Jessica I wanted a blurple jelly with glitters in Kevin's other colors in it. She decided the rest. The base color is absolutely perfect and the formula is flawless. 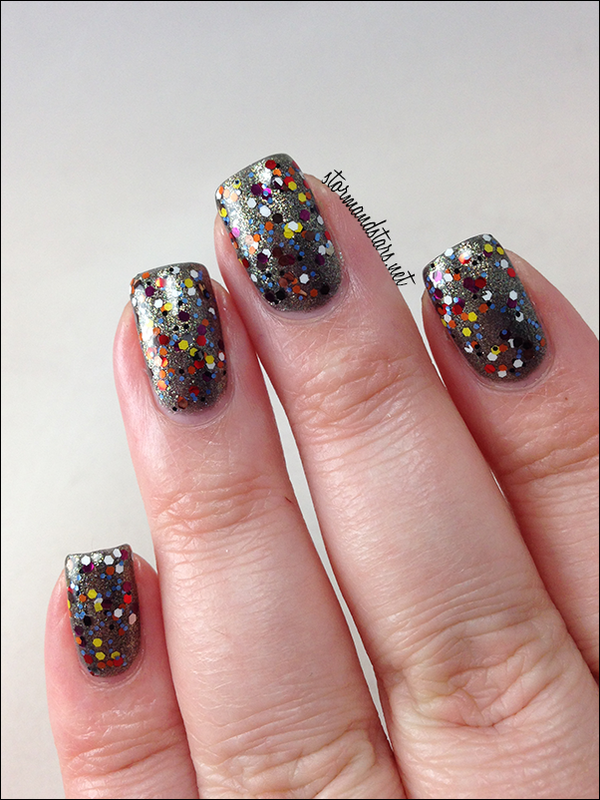 The glitters peek through and really add just the right amount of glitter to this lacquer. 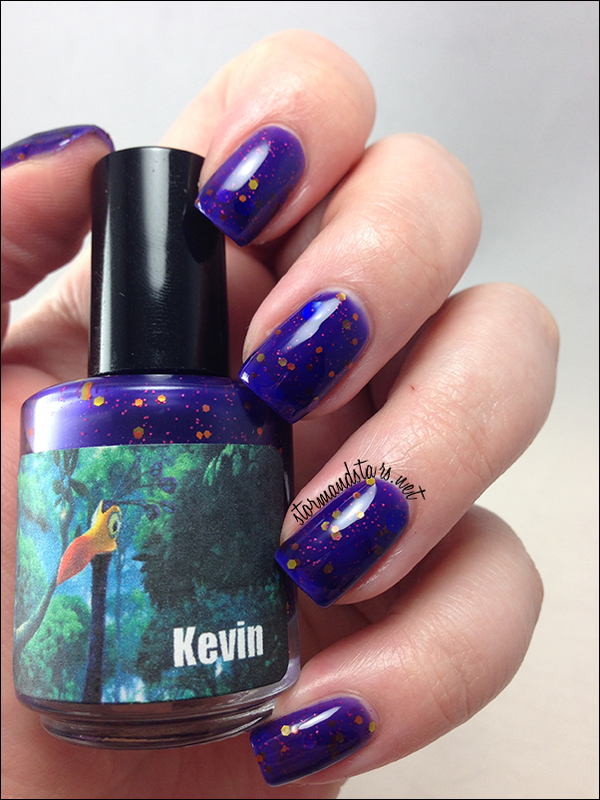 These photos are three coats of Kevin alone with Glossy Glam topcoat. 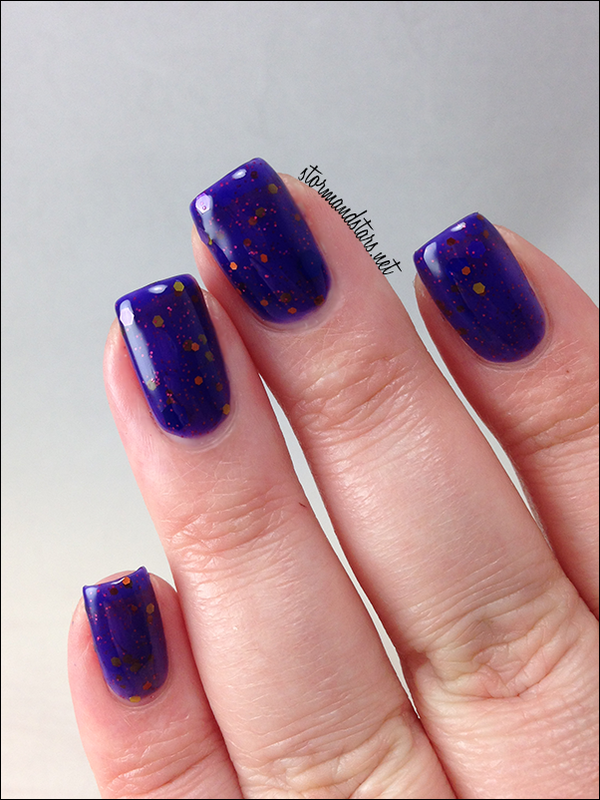 This one is one of my new favorite polishes, and again, the colors make it absolutely perfect for fall! Overall I was really impressed with the polish and the customer service at Honey Buttons Nail Polish. If you want your own custom creations from Jessica, you can head over to her site. She has an Information & Request page and also an Album page where you can see some of her past creations. Creations start at $8.00 a bottle for what you see here. Be sure to follow Jessica on Facebook and Instagram for the latest news and updates as well as plenty of giveaways and inspiration for your polishes! woaaah they are so pretty!